Celebrity Gossip and Entertainment News: Ariana Grande Dating 1D's Niall Horan? 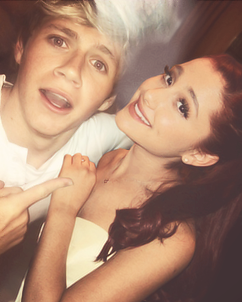 Ariana Grande Dating 1D's Niall Horan? Ariana Grande spotted leaving 1 Direction's Niall Horan's House at 3am. They set tongues wagging when they partied together in London on Monday night and it looks like Niall Horan and Ariana Grande are not doing anything to stop the rumours. The 21-year-old pop princess was spotted leaving the One Direction singer's Hertfordshire mansion in the early hours of Wednesday morning, after spending five hours inside. According to sources, Ariana arrived at the 21-year-old singer's home at 10pm on Tuesday night before leaving at 3am Wednesday but despite appearances it was not for a romantic tryst. She appeared to be with some members of her entourage and was picked up by a driver and bodyguard. Niall reportedly spent £1million on the sprawling house in Hertfordshire in October 2012. Meanwhile, Ariana entertained a sold out O2 Arena on Monday evening and later partied into the early hours with close friend Niall.